BOSS Casino Review 2019 | Is This Online Casino Worth It? BOSS Casino is a posh and luxurious gaming resource created to play and win. It offers a great Welcome package for the newcomers. Besides, it has a range of steady promotions available every week and occasional bonus offers devoted to prominent dates. BOSS Casino takes care of its players and offers easy-to-use website, comprehensive support, and secure payment processing. 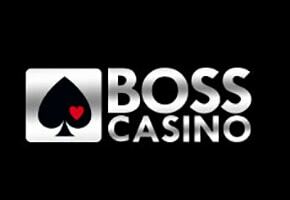 BOSS Casino is owned by Boss Gaming Group N.V. (Curacao) and is operated jointly with Boliviena Holdings Ltd (Cyprus). Security and privacy are highly important at BOSS Casino, so it uses EV SSL 256 bits encryption to protect user’s data from leaking. BOSS Casino website is licensed by the government of Curacao. Players can enjoy a welcome offer, weekly bonuses and occasional promotions at BOSS Casino. Every newly registered player can claim a 225% Welcome package and get up to EUR 700 and 300 free spins. The package is divided by deposits and players can use it step by step. After making the 1st deposit, a player gets 100% bonus of the deposit amount – up to EUR 300. Depositing the 2nd time a player gets 50% bonus of the deposit amount – up to EUR 100. Having made the 3rd deposit a player gets 75% bonus of the deposit amount – up to EUR 300. Free spins can be claimed from BOSS Casino support department. On Wednesdays, players can participate in Wednesday Business promotion and get a 30% bonus up to EUR 135. Every weekend, another promotion called Royal Weekend will grant a good prize – a 35% bonus up to EUR 105. BOSS Casino highly appreciates the high rollers and offers them a great Highroller bonus. Depending on a deposit, fans of high stakes can get up to EUR 300 or EUR 700 once a week. Also, every player can get 100 free spins daily, for the 1st deposit of the day. BOSS Casino works with the most popular payment providers to bring the best quality of payment services to players. Deposits and withdrawals are accepted in EUR, USD, and RUB and always processed in the shortest terms. BOSS Casino offers to deposit and withdraw using Visa, Mastercard, Neteller, Skrill, Advcash, Payeer, Qiwi, and Bank Wire Transfer. Though methods are the same, withdrawal and deposit time differs a lot. It takes up to 48 hours to get funds withdrawn for e-Wallets and credit cards, while bank transfer requires about 3-5 days. The total pending period lasts from 24 to 48 hours. The minimum deposit at BOSS Casino is €10, and the minimum withdrawal is €20 for any method, except Wire Transfer. The latter requires at least €1,000 to withdraw funds. BOSS Casino carefully tests every game before placing it on the website. By now, it offers about 500 games in different styles and genres. There are games and slots from such providers as AGames, NetEnt, BetSoft, GameArt, Evolution, Quickspin, Play’n Go, GameArt, Hollywood TV, Reel Time Gaming, Pragmatic Play, and iSoftBet. The greater part of all games at BOSS Casino occupy slots such as Jumanji, Jolly Roger, Gonzo’s Quest, Cute Farm, World Cup Football, Archangels: Salvation and others. However, there is also a great choice of table games, poker, roulette, and live dealer games. Customers who have questions about BOSS Casino, transactions, or games can contact customer support by chat, phone, and email: [email protected]. Qualified support agents are available 24/7 and ready to assist clients in Russian and English. Also, players can use the FAQ section to find answers to the most common questions. BOSS Casino is a great place to play favorite slots and enjoy quality casino services. Players can dive into its luxury environment with no worries as BOSS always takes care of the security and player’s privacy. Besides, the support agents are online 24/7 ready to provide the quality assistance. There are games for any taste at BOSS Casino. Players can spend time playing slots, live dealer and table games, roulette, various types of video poker and blackjack. The website has an intuitive interface designed to engage players and make it easy for them to roll over the pages. No doubt that a greater part of visitors will like playing at BOSS Casino due to its numerous advantages.